The owners of Greenhut Galleries and Angela Adams hope to draw in the foot traffic created by the neighborhood's breweries and coffee roasters. Portland’s East Bayside neighborhood might never be called an arts district. But with the prospect of a second new community center opening this spring with an arts-centric mission, it might become an arts destination. 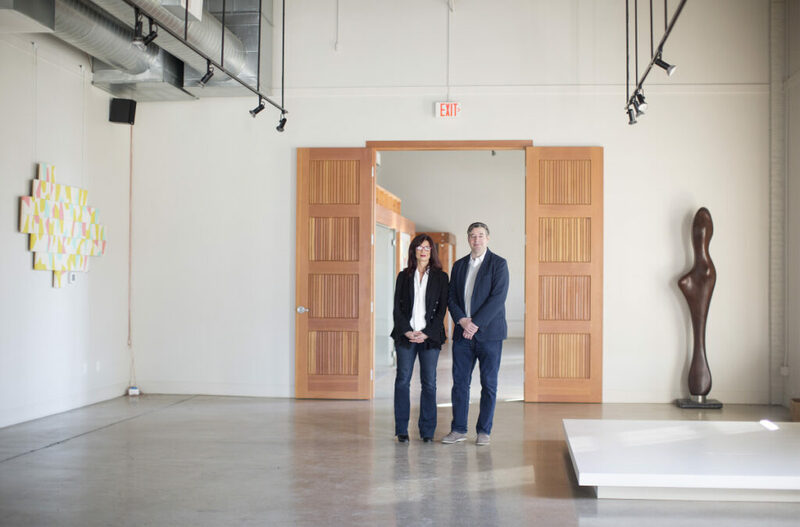 Two influential Portland art couples are collaborating to open Cove Street Arts at 67 Cove St. in a building that serves as a warehouse, shops and showroom for the Angela Adams design company, which specializes in modern furniture, area rugs and textiles. Adams and her husband and company co-founder, Sherwood Hamill, are collaborating with Greenhut Galleries owners and co-directors John Danos and Kelley Lehr. The couples plan to open a 13,000-square-foot multimedia community space that will include multiple commercial galleries, event and workshop space, and two artist studios. Angela Adams will continue to operate its design business in the building and open a showroom by appointment. Greenhut Galleries also will continue to operate its gallery on Middle Street. They are targeting a spring opening, at roughly the same time Indigo Arts Alliance is scheduled to open across the street at 60 Cove St. With the Portland art-couple Daniel and Marcia Minter at the helm, Indigo will operate as a hybrid studio and community work space that will pair professional and emerging artists of color. East Bayside is bordered roughly by Washington Avenue and Franklin Street, and stretches from the Back Cove to Congress Street. 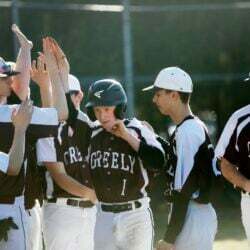 It’s close to Munjoy Hill, downtown and the Old Port. The two new community centers will add creative energy to a neighborhood that already has a lot of it. East Bayside is home to breweries, coffee roasters, restaurants, a bike shop, a tool maker – and the tasting rooms and social activities that go with some of those businesses. There’s an existing community of thriving artist studios at Running With Scissors, and the Bayside Trail runs through the neighborhood, where the Portland Mural Initiative has co-opted large industrial buildings as its canvas. 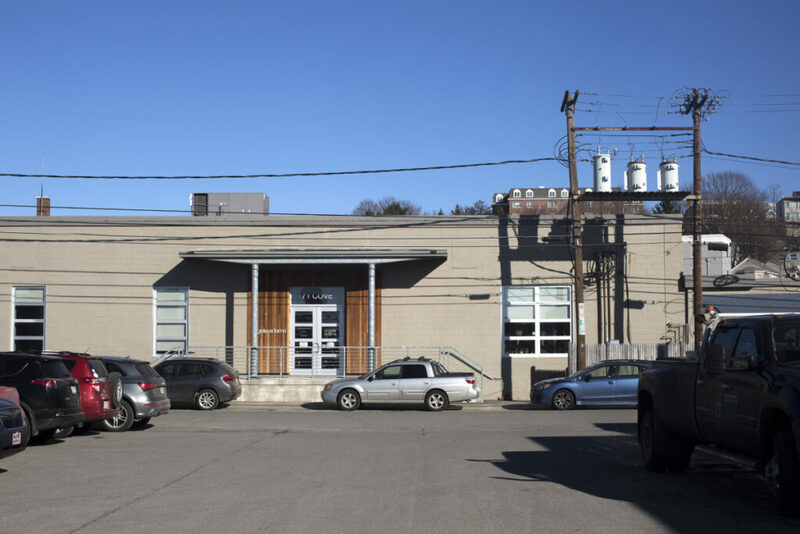 The area around Cove Street Arts is zoned light industrial, to encourage the maker movement and creative entrepreneurs, said Jeff Levine, the city’s planning and urban development director. Bars without breweries wouldn’t fit there, he said – or Coffee By Design if it didn’t also do its roasting on-site. 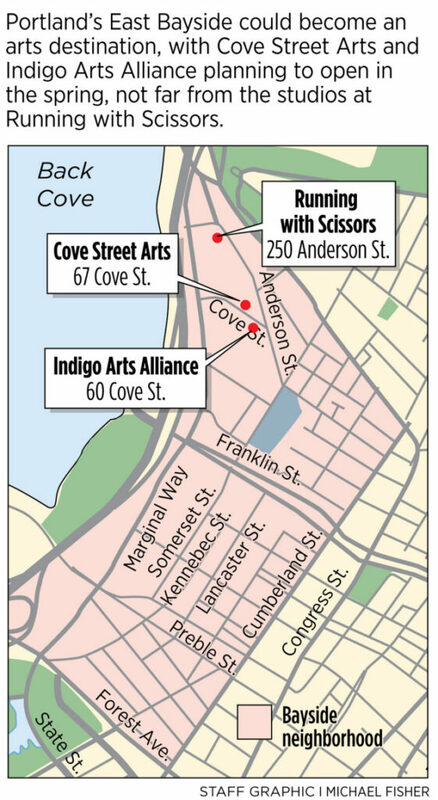 Cove Street and Indigo fit into the mix with their production of art, furniture and other items by the resident artists and Angela Adams, as well as their public assemblies and educational activities related to those artists, Levine said. Danos and Lehr are leading the gallery component of the project, which came at the suggestion of their partners. Adams and Hamill intended to open a more public space when they renovated a former electrical supply building that now houses a warehouse, shops, offices and showroom, which is open by appointment. Their original idea when they moved their design business to East Bayside was more robust, and included plans to show their own work as well the work of other designers and artists from across Maine and throughout the country. When they recognized that they didn’t have the time to complete their vision without sacrificing their creative design work, they asked Danos and Lehr to help convert part of the building into a dedicated art space and expand it into what Adams called “a full-fledged art center” with a public component. Adams and Hamill bought the building in 2014 and sold it in December to Marshall Goldman. The sale of the building was unrelated to the transition of the space, Adams said. Danos and Lehr are leasing the space from Goldman, and Angela Adams now is a tenant in the building, as well. A 13,000-square-foot space on Cove Street will bring more art to a hip area with breweries, coffee roasters and a tool maker. Danos and Lehr moved to Portland from Los Angeles when they purchased Greenhut from its longtime owner, Peggy Golden, in 2016. They live within a five-minute walk of Cove Street and made the decision to proceed with the Cove Street project because “of the hordes of people” wandering among the breweries and coffee shops, Danos said. Their vision involves converting warehouse space into three or four galleries, each focusing on a different aspect of Maine art. One gallery will focus on traditional Maine contemporary painting – “what people expect when they come to Maine,” Danos said. The second gallery will feature what Danos called non-traditional Maine painting, including abstract art. A third gallery will be dedicated to photography, sculpture, ceramics, glass and other non-painting art forms. Danos envisions public space for lectures, artist talks, movies and other events related to the exhibitions in the galleries. This space also will be available to other groups for community events. The artist studios likely will be filled by rotating resident artists, Danos said. Indigo Arts Alliance envisions a similar artist-in-residence model, and Danos hopes there will be collaborations and open-studio events among the organizations and other artists in the neighborhood.